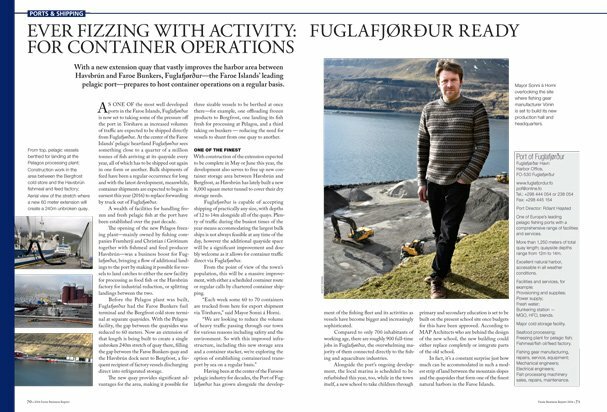 With a new extension quay that vastly improves the harbor area between Havsbrún and Faroe Bunkers, Fuglafjørður — the Faroe Islands’ leading pelagic port — prepares to host container operations on a regular basis. 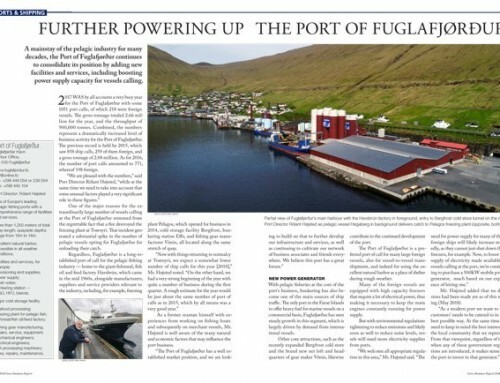 As one of the most well developed ports in the Faroe Islands, Fuglafjørður is now set to taking some of the pressure off the port in Tórshavn as increased volumes of traffic are expected to be shipped directly from Fuglafjørður. At the center of the Faroe Islands’ pelagic heartland Fuglafjørður sees something close to a quarter of a million tonnes of fish arriving at its quayside every year, all of which has to be shipped out again in one form or another. Bulk shipments of feed have been a regular occurrence for long and with the latest development, meanwhile, container shipments are expected to begin in earnest this year (2016) to replace forwarding by truck out of Fuglafjørður. A wealth of facilities for handling frozen and fresh pelagic fish at the port have been established over the past decade. 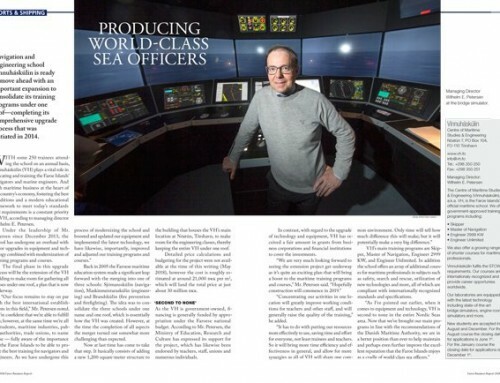 The opening of the new Pelagos freezing plant—mainly owned by fishing companies Framherji and Christian í Grótinum together with fishmeal and feed producer Havsbrún—was a business boost for Fuglafjørður, bringing a flow of additional landings to the port by making it possible for vessels to land catches to either the new facility for processing as food fish or the Havsbrún factory for industrial reduction, or splitting landings between the two. Before the Pelagos plant was built, Fuglafjørður had the Faroe Bunkers fuel terminal and the Bergfrost cold store terminal at separate quaysides. With the Pelagos facility, the gap between the quaysides was reduced to 60 meters. Now an extension of that length is being built to create a single unbroken 240m stretch of quay there, filling the gap between the Faroe Bunkers quay and the Havsbrún dock next to Bergfrost, a frequent recipient of factory vessels discharging direct into refrigerated storage. The new quay provides significant advantages for the area, making it possible for three sizable vessels to be berthed at once there—for example, one offloading frozen products to Bergfrost, one landing its fish fresh for processing at Pelagos, and a third taking on bunkers — reducing the need for vessels to shunt from one quay to another. 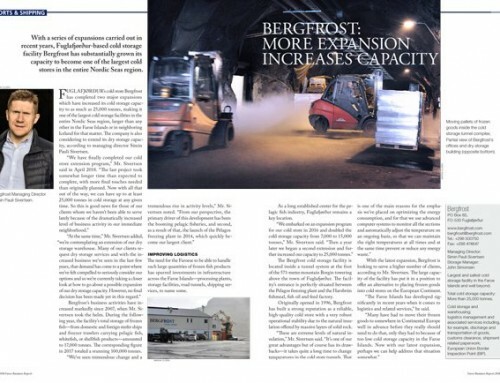 With construction of the extension expected to be complete in May or June this year, the development also serves to free up new container storage area between Havsbrún and Bergfrost, as Havsbrún has lately built a new 8,000 square meter tunnel to cover their dry storage needs. Fuglafjørður is capable of accepting shipping of practically any size, with depths of 12 to 14m alongside all of the quays. Plenty of traffic during the busiest times of the year means accommodating the largest bulk ships is not always feasible at any time of the day, however the additional quayside space will be a significant improvement and doubly welcome as it allows for container traffic direct via Fuglafjørður. From the point of view of the town’s population, this will be a massive improvement, with either a scheduled container route or regular calls by chartered container shipping. “Each week some 60 to 70 containers are trucked from here for export shipment via Tórshavn,” said Mayor Sonni á Horni. 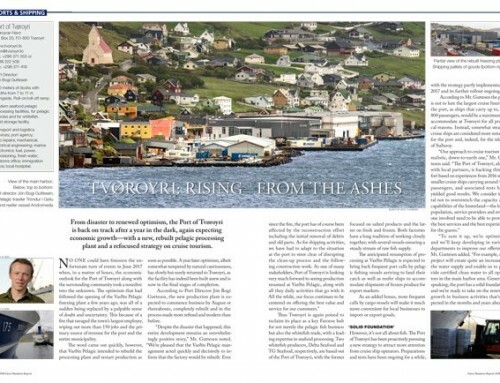 Having been at the center of the Faroese pelagic industry for decades, the Port of Fuglafjørður has grown alongside the development of the fishing fleet and its activities as vessels have become bigger and increasingly sophisticated. 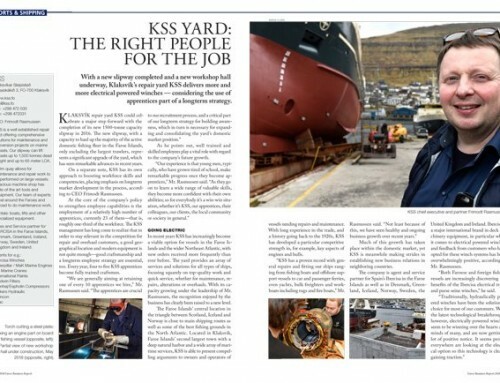 Compared to only 700 inhabitants of working age, there are roughly 900 full-time jobs in Fuglafjørður, the overwhelming majority of them connected directly to the fishing and aquaculture industries. Alongside the port’s ongoing development, the local marina is scheduled to be refurbished this year, too, while in the town itself, a new school to take children through primary and secondary education is set to be built on the present school site once budgets for this have been approved. According to MAP Architects who are behind the design of the new school, the new building could either replace completely or integrate parts of the old school. In fact, it’s a constant surprise just how much can be accommodated in such a modest strip of land between the mountain slopes and the quaysides that form one of the finest natural harbors in the Faroe Islands.